Flat sheet pallets offer a long lasting and sustainable solution to your warehouse storage. 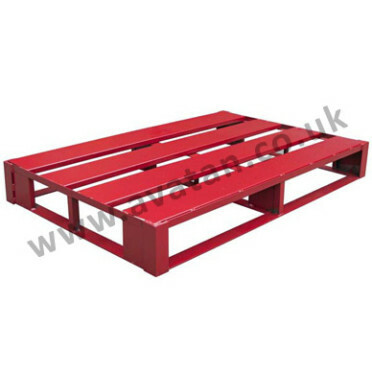 Our pallets are made from steel to cope with heavy duty warehouse activities and are fully welded steel construction. These flat sheet pallets and slatted steel pallets are built to last. They have a longer life span than the timber equivalent and are less prone to damage during transportation and use, and can be supplied with an optional raised lip to minimise the risk of the product moving during transportation. They can be designed to carry heavier loads than wooden pallet. Suitable for internal or external storage, they can be hot dip galvanised or finished in spray air dry paint. 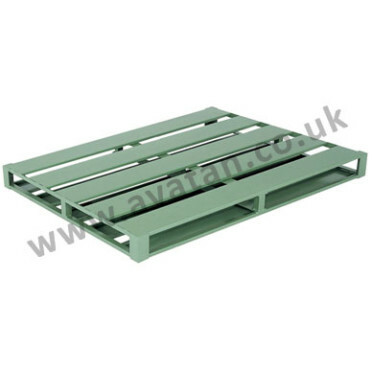 Steel pallets can be designed to stack or to be stored within pallet racking. Two way entry and four way entry by fork lift or hand pallet truck options are available. You have a choice of slatted or completed sheeted steel top, open bottom or slatted bottom, but all are compatible with fork lift trucks. 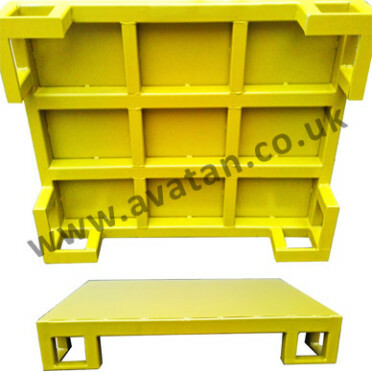 Whether you wish to carry only 500kg or 5000kg, we can design steel flat pallets to suit your needs. With over 25 years experience in manufacturing and supplying quality light or heavy duty flat steel pallets, we know and understand what makes the perfect storage solution. Our experts are on hand to offer you advice and guidance.